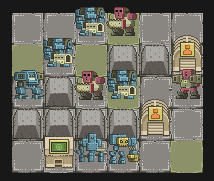 I'm working on the art of a turn based strategy game called Mutant Gangland. I've come a long way and I'm still not done. In fact: I am even stuck on some parts. Thanks for reading. It's so awesome that you made it all the way to the bottom! Could you post some 1x1 pixel screens and sheets please? It'll make it a lot easier for people to edit. Here's an edit on the colors and a few of the tiles. The top image is solely to get the sprites to pop out of the background some more. I gave them a lot more contrast then the background and I increased their saturation. I noticed that you had over 100 colors many of them very similar so before I did anything I reduced them. For this I reduced them to 32 colors. The second image, on the bottom, is an edit of the edit to try and make it a little more post-apoc. Those single pixels you sprinkle everywhere to add structure? Avoid that like the plague. Think long and hard about every single pixel you place somewhere by itself. Dithering is NOT your friend. It can be useful but that can quickly escalate into an abusive relationship. You want to go as simple as possible and noise in the background doesn't help with that. I used to do the same and learned the hard way that simple is often times better and that large clusters of pixels are not necessarily my enemy. Thanks for the edit! I think billion colors were caused by the unit's (alpha) shadows and the bushes. I really don't know how to make bushes well. Plants and stuff are my weakest part. Hahaha yeah I definitely sprinkled like there is no tomorrow. I will take your warning to heart! Actually this is good news because it seems less work to add less sprinkles. The other problem is that I just don't know how to do grass tiles so I just " oh guess I'll add some dots to distract people"
Mutant Gangland is now live in alpha phase. You can get it at mutantgangland.com. For this version I made iterations on the last version. The me what you think!